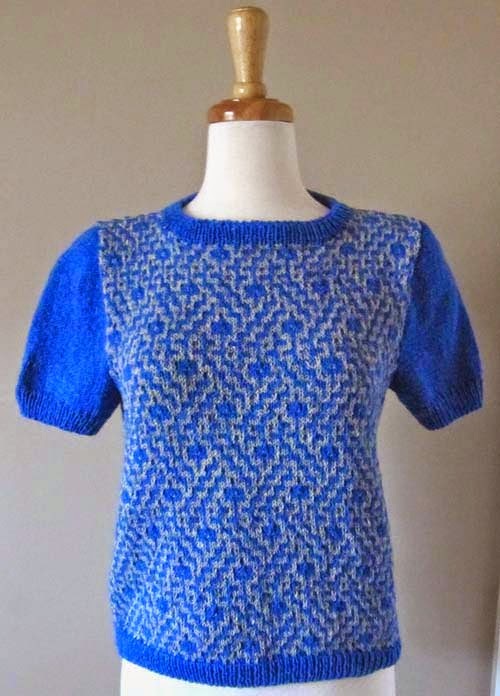 I've been on vacation and, while I haven't been blogging, I have been knitting. 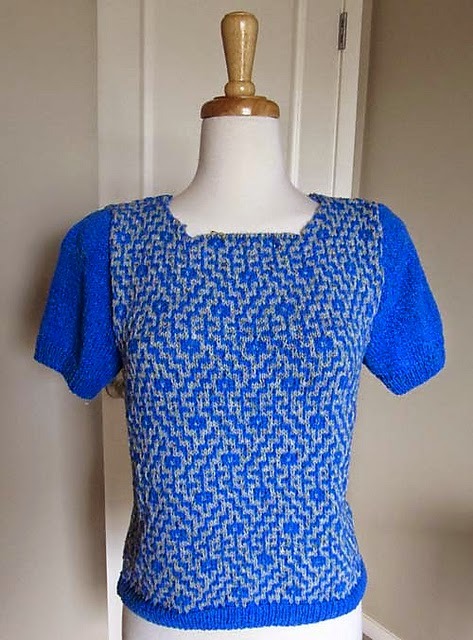 The Mosaic pullover by Lisa Richardson has been waiting for weeks to get some neck ribbing and now it's finished and I'm pleased with the results. It was an enjoyable knit and easier to make than it looks. I decided not to do the side shaping, leaving a looser fit for more comfort when sitting at a computer all day at work. A couple of inches were added to the body and sleeves. Instead of working 10 rows of rib for the neckband I did 7, purled one row to give a sharp turning edge, ribbed 7 more rows and cast off. I folded the neckband in half and sewed it in place. The biggest change was to do the ribbing in the foreground color in the hopes that the Lavold Silky Wool would have more elasticity than the Rowan Revive, which I love by the way. I also liked having dark ribbing and dark sleeves for this particular design. Instead of using the Rowan Glace that was called for in the pattern I substituted the Lavold yarn. 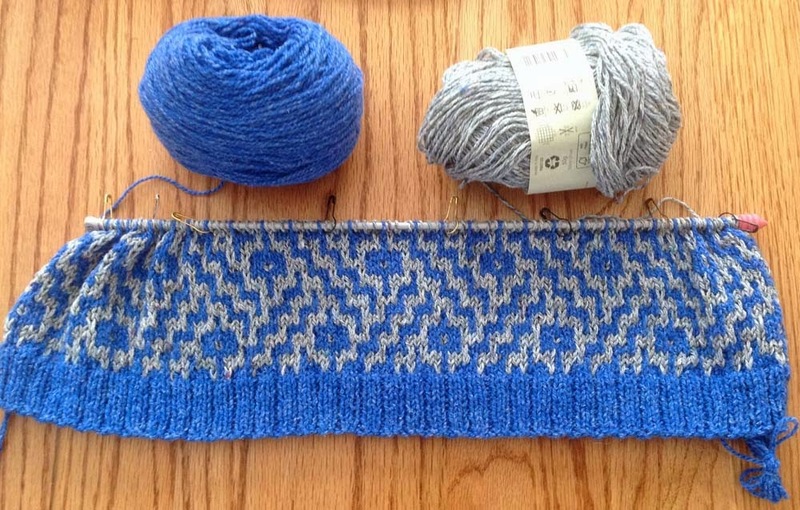 Glace is a yarn with some weight to it which I found in an earlier project. Besides, the Silky Wool and the Revive, were in my stash. Yay for using stash yarn!! As I become more aware of Lisa Richardson's designs I'm becoming a big fan. As a matter of fact there is another design that I'll be starting soon, Fiori from the new Simple Shapes Lima pattern book. Notes: There was about 1/4 of the ball of Revive remaining and only a couple of yards of the Silky Wool. Is it just me or do you, too, see a row of numbers in the design? I see the numbers repeated three times on the sweater. 2 - 6 - 5 - backwards 9? My Ravelry project page can be found here.